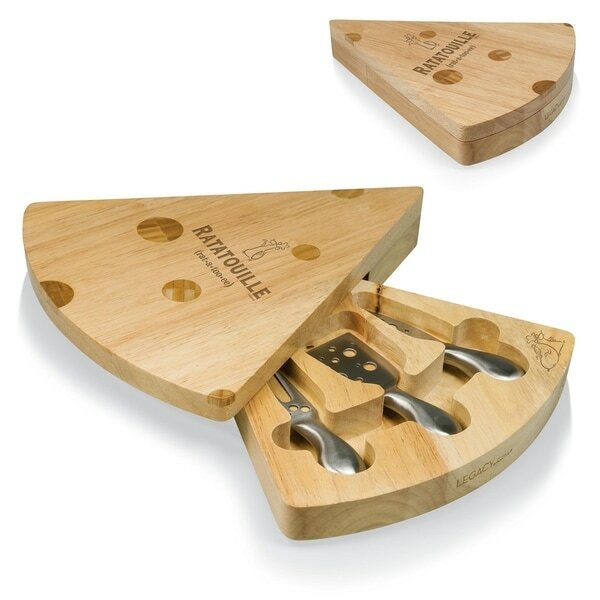 The Swiss is another Picnic Time original gourmet cheese board with tools. This wedge-shaped board is made of eco-friendly rubberwood, a hardwood known for it rich grain and durability, with bamboo inlays depicting the holes Swiss cheese is known for. The 10" x 11.5" x 1.9" cheese board swivels open to reveal three brushed stainless steel cheese tools including 1 cheese fork, 1 hard cheese knife, and 1 chisel knife (for hard crumbly), with "Swiss cheese" holes on the face of each tool. The compact design makes it an easy-to-store travel item that's perfect for the cheese connoisseur. Dimensions 10.0 In. X 12.0 In. X 2.0 In.